The Exam Gloves are ideal for use when the release of powder is undesirable. 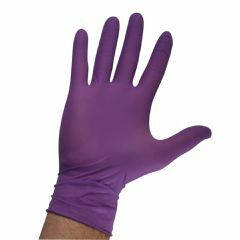 The Purple Nitrile gloves are ambidextrous and have textured fingertips which measure 9½" in length from the tip of the middle finger to the cuff edge. Comfortable. Good Fit. Sturdy. Convenient. Versatile. Home. Working with food. Working with dogs. Average Health. User. Senior Citizen. These gloves fit both my husband and myself. I use the gloves when working with food in the kitchen. And I use them with my dogs when taking walks. They are easy to put on and to remove. We have been using these gloves for years and will continue to do so. Painting. Great for motor oil chang. Spray roses and trees. I purchased the product from you because stores like the "[...]" and "[...]" don't carry X-large laytex gloves that I use on a regular basis for changing oil in the family autos, painting, spraying our 86 rose bushes, and spraying our trees, and any other use that might require or want a protective glove. I have large hands, and would recommend AllegroMedical.com to anyone looking for specialized products such as gloves to fit all hands large and small. Product is excellent would recommend. I use these as a caregiver for my mother they are very durable and I plan to buy more!!!! I am very pleased with ordering from Allegro Medical they provide great customer service!!!!!! Use it for anything around the house and workshop that would expose my hands to potentially drying or damaging fluids. Average Health. Senior Citizen. Partially retired. Have been using this product for many years. I see no need to change brands as these have always proven to be the best and at a competitive price. Hey I am interested in bying about 20 boxÃ©s of nitril gloves, can you make a delivery to Denmark and what would the price be? Thank You! How long it can be to the address, after order . Different shipping options are available. I received my order within 2 days! Great service!! We get our orders within 2 to 4 days. Excellent service.